Microneedling is a skincare technique with a name that pretty much sums up what it is and what it does: Tiny needles attached to a device that repeatedly punctures skin. Sounds fairly straightforward? It isn’t! The answer is yes, to some extent. However, despite hundreds of published studies and articles about microneedling, it isn’t easy getting to the truth about what it can and can’t do. That’s because much of the information is often skewed by either poorly controlled studies or is done by people selling the devices or procedures, meaning there’s built-in motivation for favourable outcomes. Here’s the basics of what you need to know to make an educated decision about whether microneedling is for you. Microneedling, especially when done in a medical setting, is recognised by the research for improving many different types of acne scarring. However, the before and after photographs you’re shown are always the ones that are the most impressive, you’ll rarely see pictures of the people who only had less than stellar results. Just know that not everyone will get the “best” results. The claims touting microneedling for wrinkles, skin discolourations, and pore size have research that’s somewhat less clear. Some studies show worthwhile results but others not so much and again there is the issue of the reliability of the research because it comes from the companies promoting the device or service. However, in theory, at least when it comes to wrinkles, it should work because of the way it builds support in the lower layers of skin. The other claims should be viewed with skepticism. When it comes to dimpled skin, even some of the companies selling or using microneedling devices make it clear they don’t work for that. This condition occurs when uneven fibrous connective tissue mix with fat, even small amounts of fat, and create areas of what’s known as “cottage cheese” skin. You simply can’t puncture that away. Skin striations due to pregnancy or rapid weight changes can have some minor improvements from microneedling by “loosening” up the tread marks, but it doesn’t raise up the skin or replace the scar tissue with normal tissue. 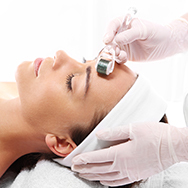 Another claim about microneedling is that it enhances penetration of skin care ingredients. There is limited research showing microneedling has some benefits for delivering topical prescription-only ingredients into skin when done in a very controlled setting, but this does not apply to traditional skin care ingredients. Keep in mind that skin care ingredients penetrate based on their molecular structure, and not all skin care ingredients need to penetrate deeply into skin. A brilliant skin care product contains ingredients that interact with varying layers of skin. If everything absorbed deeply it wouldn’t be where skin needs it most. The major issue for helping skincare ingredients absorb better into skin is what happens when skin is constantly being wounded with regular use of at-home devices which eventually cause damage. The secondary but still important issue is that skincare ingredients like antioxidants, sunscreen actives, hyaluronic acid, ceramides, and skin-replenishing ingredients in general must stay in the top layers of skin to have benefit. Environmental free-radical damage hits skin’s surface layers first, so if there’s nothing there to help these troublemakers simply keep going, stopping them sooner is better for skin. Some ingredients, such as retinol, could benefit from deeper absorption, but that's not always a good thing because when skin is compromised that direct absorption can cause a sensitising reaction. An enhanced slow-release delivery system in the retinol products you buy is so much better for skin. Dermarollers resemble small manual paint rollers with a round, rotating cylinder that has up to 200 tiny needles protruding from it and a handle for moving around it your face. These are sold for at-home use. Yes, they puncture hundreds of tiny holes in your skin. Thankfully these rarely break the skin—but as we explain below, using such tools at home is probably not a good idea. Dermapens look like a pen, with a circular head studded with tiny needles. The motor-driven needles move in and out of the skin, piercing it with thousands of tiny punctures. The concentration of the needles in a tiny point is helpful for small dented acne scars. These are mostly used in a medical setting but they can also be purchased for at-home use, but again, this could be a bad idea. Dermastamps resemble Dermapens but have a larger head with more needles protruding from it for use on larger areas. Dermastamps may be motorised or manual, and work exactly as the name implies: Rather than rolling needles over the skin the needles are systematically stamped into skin. Microneedling devices used with light emitting diodes (LED) is a process of using a microneedling device with an LED device. LED light has been shown to have benefit for skin rejuvenation. However, published research about this combination doesn’t exist at this time except from companies promoting it. Microneedling devices used with radiofrequency involve a machine that uses needles to penetrate skin and simultaneously release radiofrequency currents from the needle tips producing heat remodeling at the same time. This is quite new and the research showing the combination is better than radiofrequency by itself doesn’t exist yet. The major question we’re asked is whether or not at-home microneedling devices actually work. There’s just very little unbiased research showing positive results and the risk is what happens when you overuse the device, which is so easy to do. Repeatedly injuring the skin is a bad thing, even though you might not see it because it is below the skin surface, and the tendency with devices like this is if a little bit is good, then more must be better. Another important factor to consider is that at-home devices are not as of yet regulated by the U.S. FDA. This means there are no regulations establishing legitimate guidelines for what these devices can actually do (or even claim they can do) and what their risks may be. The U.S. FDA is working on it but in the meantime it’s a jungle of claims and no oversight. The fine point (sorry, we couldn’t resist) on microneedling is that in some situations, such as doctors’ offices, this practice can have benefit, especially for reducing the appearance of scarring and wrinkles. For microneedling at-home, there’s not enough unbiased research to support adding this tool to your skincare routine. The potential negatives outweigh any possible benefit if you overuse it and knowing when you’ve gone too far can be hard to determine, especially if you’re seeing good results.